Did you get the memo? Hadiya is setting herself up to become not only Chicago, but the World’s new rising star. 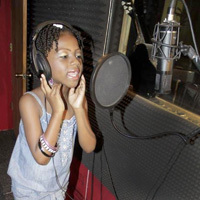 Hadiya is a unique talent, not because she is six years old and plays the violin, nor is she unique because she can rap seamlessly in different styles. She is unique because of her ability in the early stages of her career; to execute her craft at such a high level. She already has two single releases in her young career, with a 3rd release coming in August 2012.